Forest Baseball Club is a registered provider for the Active Kids rebate. Once you pay your full fees, please submit your voucher number and bank details to Jenny Russell (treasurer@forestbaseball.com.au). The club will log the voucher and process the $100 refund in due course. 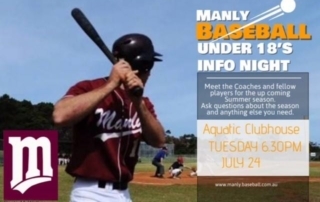 For those that are age eligible, an information night for Manly U18s is being held on Tuesday, 24th July at the Aquatic Clubhouse. Follow in the footsteps of Manly's State Championship winning side from this year that included a number of home grown Forest players.